Originally posted Sep. 2014. Recipe and post updated Oct. 2017. Are you a squash lover or hater? I think squash gets a bad reputation, but I really like it. I think it’s all about HOW you prepare it. Straight up steamed? Not my favorite. Pureed into a Thai Chicken Curry Soup? Incredible. Caramelized? Amazing. Paired with Tex-Mex flavors and tucked into a tortilla? Count me in. 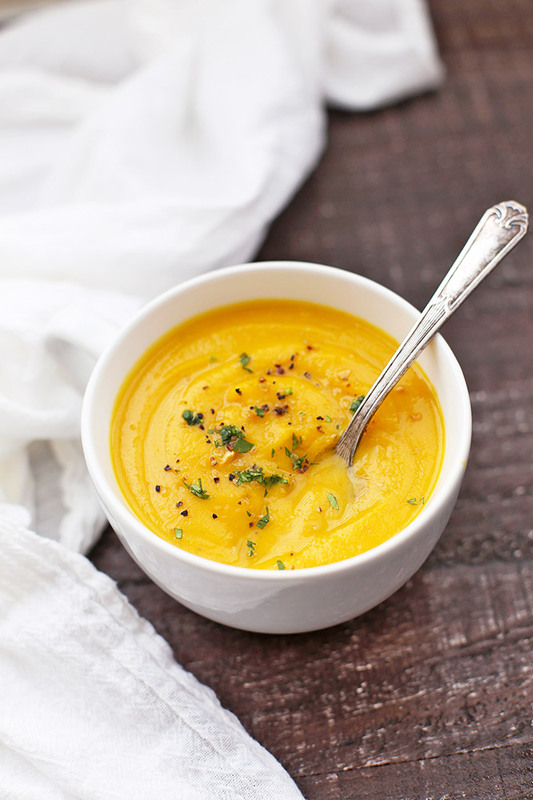 This roasted butternut squash soup is the recipe that won Michael over to Team Squash several years ago. It’s incredibly simple–just a handful of quality ingredients and a basic method. But somehow, the (easy-as-can-be) method gives this soup some pretty magical qualities in the flavor department. The squash gets some golden edges while roasting, the caramelized onions lend some sweetness and depth, and a small splash of balsamic vinegar rounds the soup out. The end result is FANTASTIC. 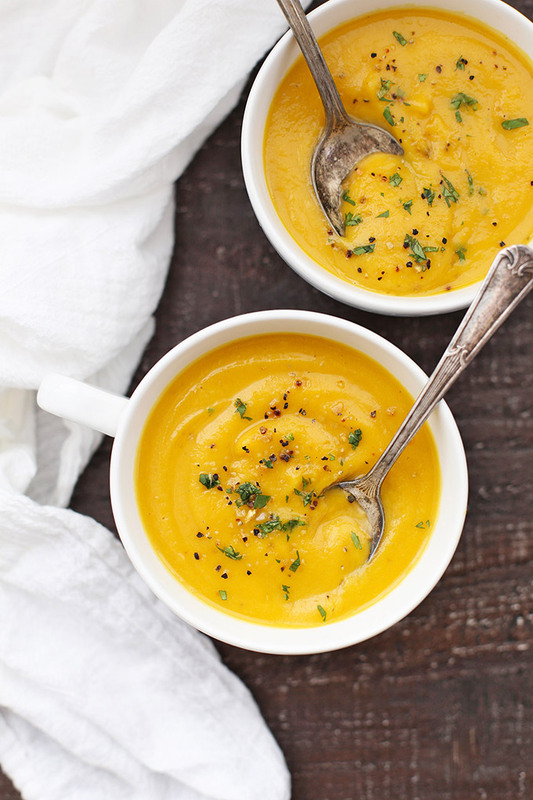 This creamy, silky-smooth roasted butternut squash soup is comforting deep down in your happy place. It’s got loads of flavor, thanks to the delicious sweetness that roasting brings out in the squash, as well as nice notes from the caramelized onions and balsamic vinegar. Each of the flavors comes to play here, and I’ve found that they really blend together beautifully. Pureeing the soup gets rid of any texture issues and it’s one that my whole family will eat (even though NO ONE would think of eating the onions or squash on their own). It might surprise you (and your kids or husband). Be brave! Kids & The Magic Soup Spoons – When my kids were toddlers, they wouldn’t only pick at soup, and I couldn’t quite figure it out. Then, I realized Milo was getting frustrated with his spoon and giving up. I handed him one of our asian soup spoons, and his life has been completely changed. They spill less and teach the right motion for using a spoon. Suddenly, he turned into a soup guy! And I don’t have to feel hopeless every time I make a big pot of soup that I’ll be the only one eating it at dinner. Win-win. Tips for Blending – PLEASE BE CAREFUL when blending your soup. It’s easy to get burned by hot soups when blending. My trick here is to use room-temperature broth when blending after letting the roasted squash and caramelized onions cool down a touch. The broth cools everything down enough not to be dangerous and it works GREAT. Tools of the Trade – On that note, let’s talk blenders. I love the smooth texture I get from my Blendtec, but I also really love the convenience of an immersion blender, which is a little handheld blender you can use right in your pot. It’s a pretty inexpensive kitchen investment and works for making ranch dressing, pureeing apple or pear sauce, or smoothing out soups and sauces. Paleo & Whole30 Notes – Balsamic vinegar *IS* Whole30 approved if it doesn’t contain added sulfites (naturally occurring are A-ok). You can also sub in beef or chicken bone broth for the veggie broth if you like, or even add a scoop of collagen protein to this soup. It blends right in and adds a bit of protein. *Quick Tip: If you’re having trouble cutting into your squash, you can microwave the whole thing for 1-2 minutes. It’ll be easier to peel and dice. Toss diced squash in a drizzle of olive oil. Sprinkle with salt (and pepper, if you like) and place on a baking sheet. Roast the squash at 375 degrees for 30-40 minutes, or until tender and the edges are starting to caramelize. While the squash is roasting, heat another drizzle of olive oil in a sauté pan over medium heat. add onion and cook over medium-low heat, stirring regularly to caramelize the onions. When they’re golden and tender, sprinkle a bit of salt (and pepper, if you like) over them. 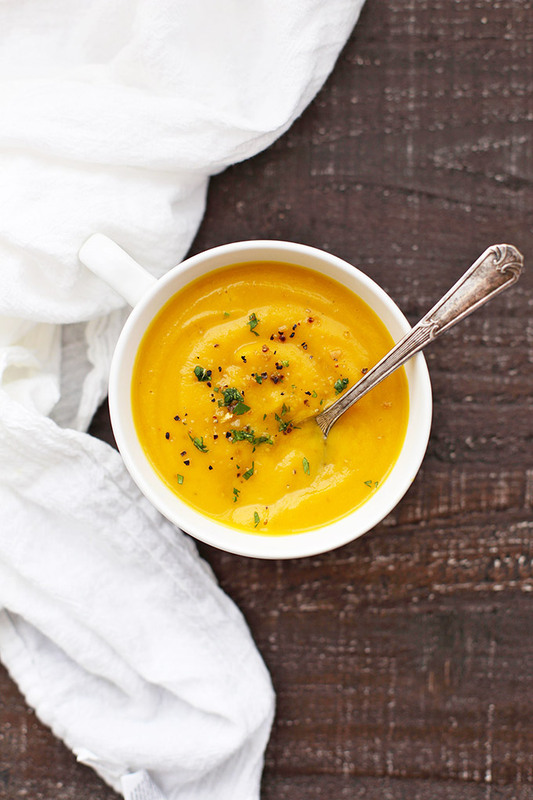 When the squash and onions are finished cooking, let them cool slightly, then add them to a blender, or food processor, along with 3 cups of vegetable broth and 2-3 teaspoons of balsamic vinegar. Puree until very smooth, working in batches, if necessary. Taste and add additional salt, pepper, or balsamic vinegar to taste. If the soup seems too thick, add additional broth and mix until incorporated. Note: If you’re working with an immersion blender, add the cooked squash, caramelized onions, broth, and vinegar to a soup pot and puree until smooth that way. Can the balsamic vinegar be eliminated or substituted? I think you could just skip it if you’re not a fan. It adds just a little acidity to cut through some of the sweet. I think other vinegars would be a bit too strong. I’ve made this soup twice in the past week. Yesterday, I rushed the roasting of the Butternut Squash – it was cooked soft but the edges had not begun to darken. I absolutely still loved the soup, but also learned that roasting the squash until the edges caramelize and get crispy really does have add the most delicious flavor boost. 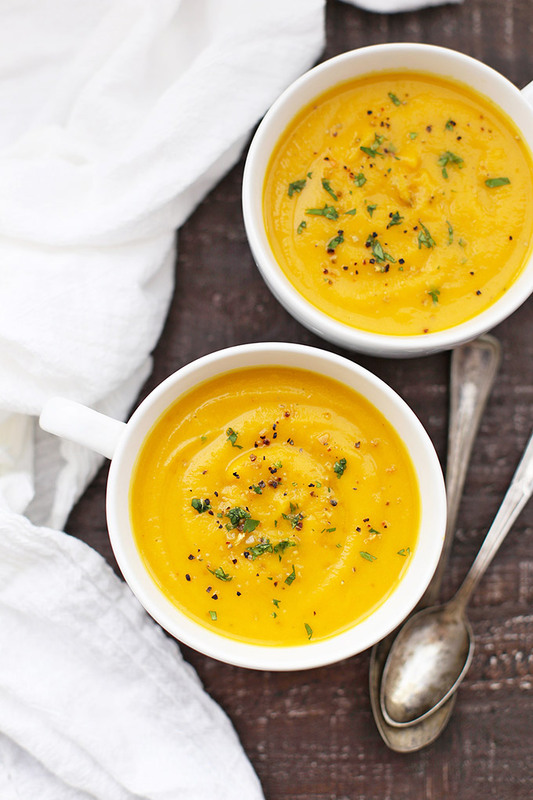 This soup is so flavorful, savory, and simple! This soup is so easy and delicious. I bought pre-cubed squash so it was super fast too. So glad I stumbled across your sight. I’m looking forward to trying many more of your recipes. Anne – I’m so glad you liked it! Thank you for your happy note! This sounds delicious! I’m starting my whole30 next week and just wondering how many servings you got out of this? It’s surprisingly filling, but you’ll get at least 6, depending on the size of your squash. Best of luck on your Whole30! 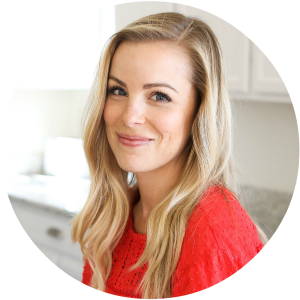 I’ve got lots more Whole30 Friendly recipes in the recipe index! What is the herb you garnished with? And is that a seasoning salt you sprinkled on top? I used cilantro for the photos, but I’ve added basil or parsley before, too. I often don’t put any herbs at all–you won’t miss anything by leaving it off! And I used a coarse ground pepper blend for the sprinkle, along with some Maldon sea salt.